This fall, the Library is partnering with organizations and departments throughout campus to present several events commemorating LGBT History Month and the 2016 election season. 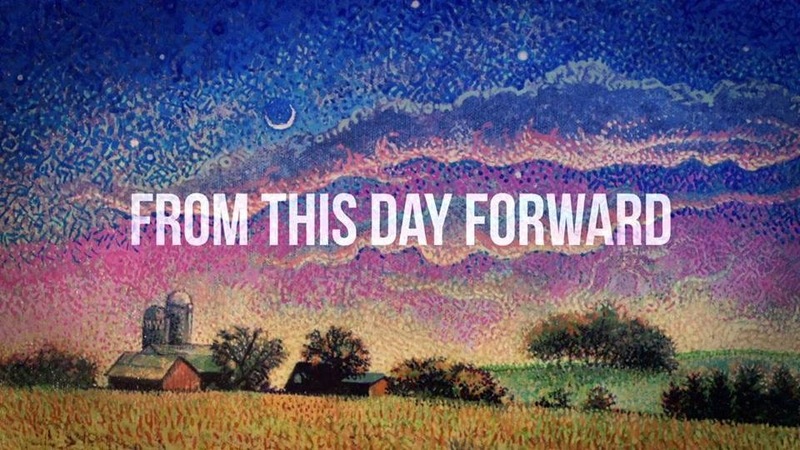 As part of the Office of Multicultural Student Services’ celebration of LGBT History Month, the Library will present a screening of the documentary From This Day Forward, which explores how a daughter and her family cope with her father’s transition from male to female. The screening will take place on Thursday, Oct. 27 at 3 p.m. in the Library Media Classroom. Cult & Civ points are available. Throughout this election season, the Library has partnered with the Office of Student Development & Leadership and the University’s Civic Engagement Working Group to sponsor a series of election-related programs, including Presidential Debate Watch nights. As Election Day draws near, the Library will host a panel discussion on exploring issues such as first-time voters, race and social justice issues, and media and social media coverage of the election. Panelists will include Lewis faculty members Dr. Steven Nawara, Dr. Christie Billups, Dr. Jennifer Buntin, and Dr. Anne Rapp, as well as a student body representative. The panel will take place on Tuesday, Nov. 1 at 4 p.m. in the Library Media Classroom. Cult & Civ points are available. 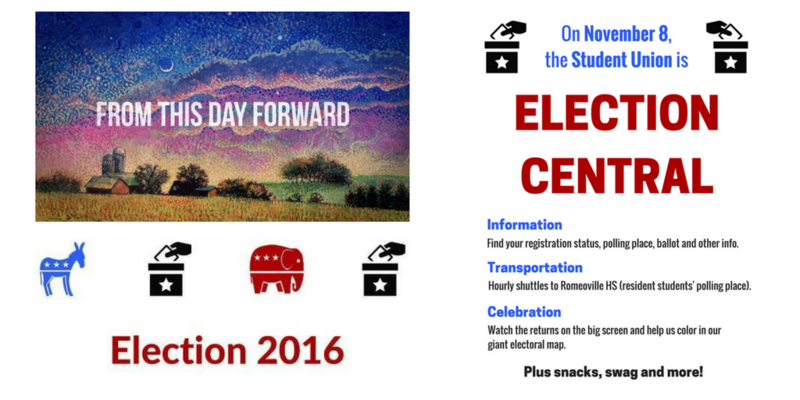 Finally, on Tuesday, Nov. 8, the Library will co-sponsor a daylong series of election-related programs and services. The Student Union will become Election Central, with an information table where students can check their registration, find their polling place, and view their ballot. 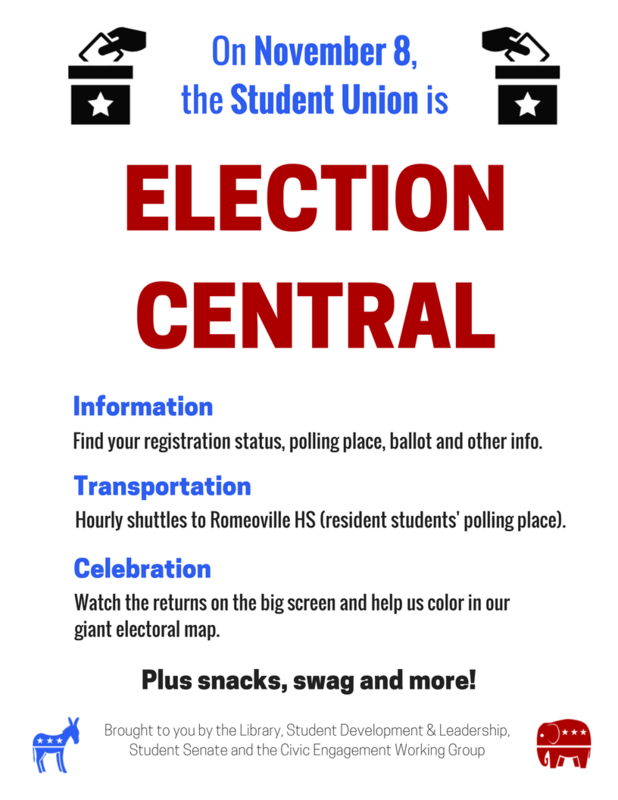 In addition, shuttles will transport resident students to the Romeoville High School polling place on the half hour. Snacks will be available, and the big-screen TV will be tuned to election news throughout the day and into the evening, when we’ll watch the returns come in and fill in our giant electoral map.